Gas bottles are placed in specific locations with set clearance zones designed to keep you and your property safe. So what are the key things to watch for? Solid and upright.Gas bottles must be placed on a solid base made of a fireproof material like concrete or pavers, and kept upright at all times. This will keep the gas bottles stable and allow them to safely vent any excess pressure through their pressure relief valves. The space the gas bottles sit in needs to be well ventilated – so spots under stairways, buildings, alcoves or underground are usually not suitable. No ignition sources.As LPG is flammable, gas bottles must be kept a minimum distance away from ignition sources. This reduces the risk of fire in the unlikely event of a gas leak, or during delivery when small amounts of LPG can escape into the air. Potential ignition sources include anything that carries electricity or a flame, like light switches, power points, air conditioning units, lights, motion sensors, security cameras, hot water heaters or BBQs. No building openings. 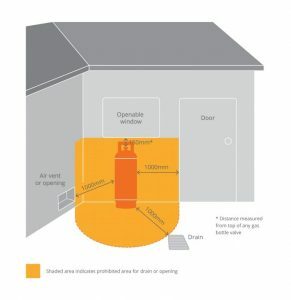 To prevent an LPG leak entering buildings or accumulating in an enclosed space, gas bottles must also be placed away from any wall openings like windows, doors or air vents. No ground openings. As LPG is heavier than air and will sink to the ground if there is a leak, gas bottles need to be kept away from any ground openings like drains or pits. 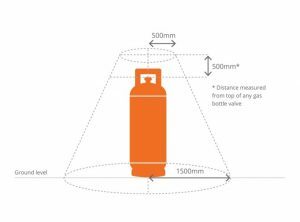 If you have Exchange Cylinders –LPG bottles are swapped for full ones when they run out – the minimum clearance levels are shown below. Clear access.Locked gates, steep driveways, uneven pathways, low-hanging trees, lots of steps and unrestrained dogs are all items which can prevent a gas truck and its driver from accessing your property. No obstructions.The space around your gas bottle installation also needs to be kept clear. Be sure to keep the area free of shrubs, wood, bins, rubbish and other household items. Once your LPG installation is complete, your gas fitter must give you compliance documentation to show that the relevant regulations have been met. Queensland– Certificate of Compliance and Compliance Plate affixed to installation. It’s important to keep these documents in a safe place. In Queensland, your LPG supplier will need a copy of the document or your compliance number before they can deliver gas to you. If you’ve lost your compliance documentation, you can get a replacement from a licensed gas fitter. Previous WIN FREE GAS FOR A YEAR!